Gustiamo goes to the Fancy Food Show, booth #2949 (read all about it here) at the end of June and it already looks promising. 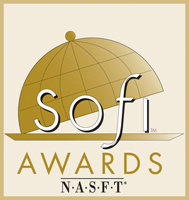 We just received notice that our Vicopisano Extra Virgin Olive Oil is a finalist for the SOFI gold Awards. You might have never heard of the SOFI Awards, but it’s a big deal, in the specialty food business. It’s considered the highest honor in the industry, like the Oscars for movies. In fact, the award itself looks like an Oscar statuette with the chef hat. A national panel of experts spends three days tasting and evaluating some 1,500 products. They choose 111 Silver Finalists in 31 categories and Vicopisano won in the Olive Oil category. After this description, don’t you feel you must meet the man who makes this wonder of nature possible? Click on this link and watch Nicola interviewed by me, last year. Then, come to the Fancy Food Show to taste his olive oil and meet him personally. We would love you to meet Vicopisano in the comfort of your home, even before you meet Nicola at the Javits Center at the end of June. Write “SOFI” in the “special instruction” box of your shopping cart and your bill and credit card charge will reflect a discount of 20% Vicopisano Olive Oil. Promotion valid until June 25th. Next Post Junk Food Goes Local!